Despite weather that threatened to make Goodwood seem more like Glastonbury at times, the 2016 Festival of Speed proved to be as impressive as ever. ESM was there, for two days this time, getting up close and personal with as much of the machinery as possible. We could write 1,000s of words but, instead, we’ll give you the pictures first. Trying to pick which photos to feature isn’t easy given the ridiculous selection of race and road cars on offer at the Festival of Speed. To try and keep things simple, we’ve broken it down into three galleries: the highlights from the paddock, what the manufacturers brought to the motor show, and cars in action tackling the hill climb. In this first gallery we’ve covered our favourites from the various paddocks at Goodwood, where it’s possible to be inches away from priceless racers and motorsport icons. We’ve also included what we found after the (long) trek to the rally stage at the top of the hill, and a special feature on BMW. World Rally Champion for the past three seasons, and still looking unstoppable. VW Polo WRC’s latest livery does look good. Lancia Delta bodywork, on top of a spaceframe chassis and a 900hp Toyota Supra engine?! Jason Plato’s 2016 Subaru Levorg BTCC car. Fresh from setting a record-breaking lap on the Isle of Man TT course. Genuinely good to see Subaru properly back in motorsport. Audi V8 quattro DTM racer took titles in 1990 and ’91. 629lb-ft of torque – in 1936! Not so streamlined with the bodywork removed. Gullwing doors will always be cool. New Mercedes-AMG GT3 racer looks monstrous. Static display only for the 1996 Porsche 911 GT1. Looks more road car-influenced than later GT1s. Something quite weird about an epic racer left largely ignored in the paddock. Two-time IMSA winning Nissan NPT-90. So much wing. Supercharged BRM V16 made 600hp from 1.5 litres. Not reliable, however. Long nose? Bit rude. Good enough for 6th place at Le Mans in 1956. Ford was celebrating the 50th anniversary of winning Le Mans in 1966. This MkII GT40 used a 7.0-litre engine, like the Le Mans winner. Lengthened MkIII GT40 was built for road use. Ferrari tried to crack the Indy 500 in 1952 but this 375 ‘Piston Ring Special’ failed to qualify. Honda RA300 F1 car had a 400hp V12 and 48 valves – in 1967! A multitude of turbocharged Renault F1 cars. A very special Lotus-Renault 97T. The car driven by Ayrton Senna to his first ever F1 win in 1985. Property of Billy Gibson from ZZ Top – Whiskeyrunner hot rod. Wheels of a King – The King – Richard Petty, in fact. 1972 Dodge Charger driven by him to victory that season. 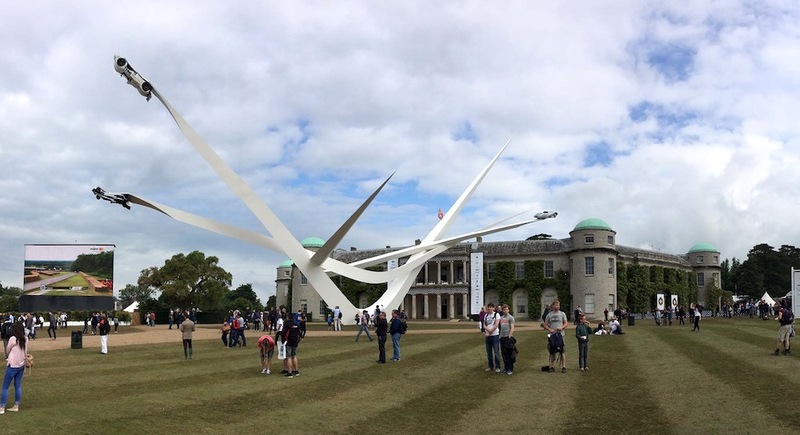 NASCAR seems to grow in popularity every year at Goodwood. Oh dear. Ash Sutton makes a mess of the MG6 BTCC racer on Sunday morning. New Ford F-150 Raptor, driven by “that guy who used to the Stig” Ben Collins. BMW was the featured marque at the Festival of Speed, so the brand accounted for a lot of the cars on display. Including one particular car that’s very dear to ESM’s heart. The car that dominated the 2001 ALMS – E46 BMW M3 GT. BMW fitted a 4.0-litre V8 in place of the regular 3.2-litre straight-six from the road car. The M3 GTR won 70% of all races in the 2001 on the way to victory. The business end of the beast. At least 450hp came from here. Rule changes, chiefly the requirement to produce 1,000 engine units, led to BMW canning the GTR project in 2002. A wealth of Brabham-BMWs. Most of which belong to some guy called Bernie Ecclestone? Infamous ‘Batmobile’ BMW 3.0 CSL from 1975. Looks quite tame compared to modern racers. The original M-car from 1979. BMW 635CSI. Three-times a winner of the European Touring Car Championship. Everyone’s favourite M3? Original E30 here in 1990 DTM specification. Although it couldn’t match the success of the original, the ‘Long tail’ McLaren F1 GTR took two podium places at Le Mans in 1997. 1999 Le Mans winning BMW V12 LMR. The last beautiful LMP car? BMW won the DTM championship in 2012 with the E92 M3 racer. Definite Auto Quattro overload this year. Group 4 Quattro from 1981 on left here. Whilst this is the 1983 A1 Quattro, as driven by Hannu Mikkola on the way to the drivers’ championship. Couple of Quattro road cars, just to add to the mix. Vans in period livery neat touch, also. Short-wheelbase S1 from 1984 gave Stig Blomqvist the drivers’ championship that year. Crazy-winged E2 version of the S1 would follow later. A Citroën Visa Chrono – doing its best to shed weight along the way. Vauxhall Chevette HS was a useful rally weapon in the late 1970s. Lancia stuck with rear-wheel drive at the beginning of the Group B era with the 037. ST185 Toyota Celica GT-Four (left) won 3 drivers’ WRC titles in 1992, ’93 and ’94. ST205 Celica was the car which had Toyota banned from rallying for cheating. Fact. Toyota Corolla WRC is probably most famous for Carlos Sainz losing the 1998 title, just metres from the Rally GB finish line. 1997 Subaru Impreza WRC was driven by Colin McRae, although he missed out on a second championship by just one point. Possibly one of the best-looking WRC cars. Petter Solberg drove the 2003 Impreza WRC to championship glory. We’ve more to come, so make sure you check back soon.